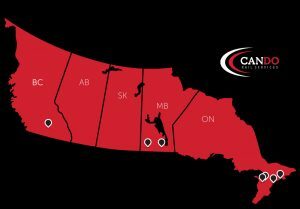 With more than 5,000 railcar spots located in yards and dedicated facilities across Canada, Cando can store any type and size of fleet. Cando has close working relationships with Class 1 railways and daily interchange into major switching yards. As a result, we offer a highly responsive railcar storage solution for customers with long- or short-term storage and staging requirements. Our national network allows you to have one railcar storage provider for your entire fleet. Cando is the largest independent railcar storage and staging company in Canada, with more than 5,000 car spots in strategically located yards and sidings across Canada.